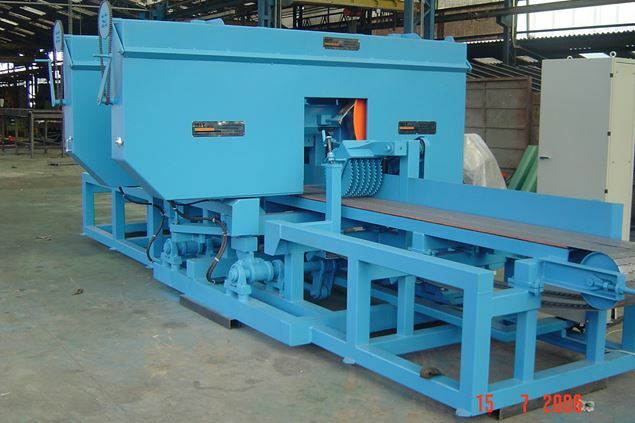 MIT has four models of the horizontal band resaw. The 1000 model works well with cants and slabs. It has heads mounted on a reinforced frame, 40” (1000mm) diameter fabricated solid steel wheels for 2 or 4” bands. It has one 60hp electrical motor on each head either 50 or 60 htz. A variable speed drive for principle motor is included along with a polychain belt drive. Also includes a 13’-0” infeed and outfeed metal tabletop chain conveyor. Available with manual head adjustment or a Mudata programmable measuring system. We also include a Lubie lubrication system for ease of lubricating.